No I'm not kidding, today we're taking a look at Candy Land! "But Capps, everyone knows how to play Candy Land. Seriously, you're going over the rules for this? Really?" Absolutely! If that picture above confused you there's a chance you may not have seen the newest version of Candy Land then. New art, a spinner instead of cards, a much more compact size, and an even cheaper price. No matter what the game is and no matter how famous and popular it is THERE IS SOMEONE WHO HASN'T PLAYED IT. If you are one of those people or just want to learn more about the newest version, check it out here. Now for those new people to the game they are going to need to read the rules to learn how to play it. Heck with the spinner the game has actually changed a bit so you may need to glance at the rules. 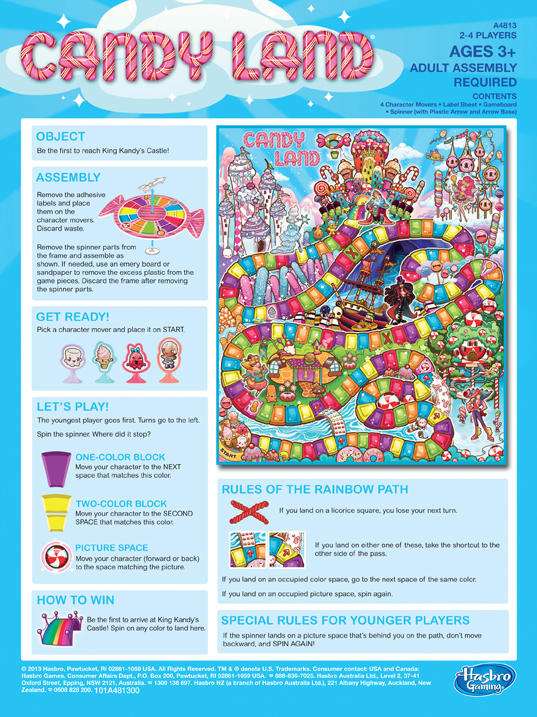 Plus the mentality of "everyone already knows how to play Candy Land" made me wonder if the mighty Hasbro may have slipped up on the rules. If you want to see a picture of the rules so you can follow along click here. Can I catch a serious rulebook slip on this well known classic? Read and find out! Organization and Layout: Everything is bright, simple, and in order. There is no way from navigating this single simple sheet of paper that you could get lost. It's really got a nice layout, no complaints. Graphics: The artwork is adorable! But for the important part of the rulebook the graphics used to show everything were clear and incredibly easy to understand. Writing: Everything is written and presented professionally and is something a young reader could get through. Clarity/Depth: Now if you read my review often you will know that this is out of order and that usually these two categories aren't combined. This is because I caught Hasbro!!! I'm almost a bit too excited on this one but let me explain. The rulebook actually is missing something INCREDIBLY vital. Now that is rather small and hard to see, to to help out: "Be the first to arrive at King Kandy's Castle! Spin on any color to land here." This little rule right here being ambiguous actually makes the game unplayable. Now, do I have to spin every other space up to the castle? If for some reason a rules lawyer sat down to Candy Land I bet they could convince someone that as written all they do is spin the spinner and as long as they don't spin on a Picture Space they automatically win. Now I tried to give some lenience and said "Okay, I know how to play Candy Land and most others would see that doing that isn't the point of the game." But still I realized there was a problem. At what point am I allowed to start spinning any color to win? Let's say I'm a few spaces towards the end, do I have to get a green, red, purple, then yellow to win, or can I move to the rainbow space as soon as I spin a color no longer available for me to land on? what about double colors? Before you think I'm being silly about this a little searching on google and I still couldn't find the answer in older rulebooks. I checked out the rulebooks from 2001, 2003, and 2004 as they were the only ones I could find and none of them held the answer. PLUS I even found on these sites that people were asking how you actually win the game, the question I asked above. Everyone knows how to play Candy Land? No. The proof is right there, and Hasbro has not only missed it in this edition of the rules but in several others. Susan's Explanation: I hate to give it this rating. This rulebook is just a stunning example on all fronts except for that one tiny rule. But this rulebook does fail to do what it is intended to do, teach a brand new player how to play the game so I had to. One little change for clarification and this easily could have even been Susan Approved. Plus to learn that this has actually been a problem in previous rulebooks and wasn't addressed saddens me as well. For everyone who reads our reviews and uses the things we read here to help them craft a better rulebook there is a serious lesson to be learned here: Even the simplest games could be ruined by a bad rulebook, and no one not even the largest board game manufacturers in the world should not have their rules edited. Think I was maybe too harsh? Do you have an older edition of the rules that has the answer to my question? DOES ANYONE KNOW THE OFFICIAL RULES SO I CAN KNOW HOW TO PLAY!?!? Let us know below! Until next time: Every Game (Even Candy Land) Deserves A Good Rulebook.